What’s more romantic than a wedding by the sea? The beach is a very picturesque location, and, if you schedule your ceremony at sunset, the atmosphere becomes even more magical. A symbolic or civil rite can be organized, and, for some years now, many Italian municipalities offer the possibility to officiate weddings on the magnificent beaches of our coastline. Many couples dream of a beach wedding: there’s particular and scenic charm to say I do at sundown, with just the clashing of the waves in the background. A bride can wear a comfortable and soft gown, even better if short, leaving her more freedom to waltz and move around. White is a perfect colour to get married under warm sunlight, but you could also opt for other hues, such as light blue, pink or ivory. As for the bouquet, you could choose a composition made of white flowers, with the addition of shells and an aquamarine sash for a strong beachy theme. Even Italian beach establishments have now adapted to this trend, and offer couples the opportunity to rent out their seaside restaurants and pools to host their wedding reception. An even more magical and evocative atmosphere can be created by setting up a beach with candles, torches, arches and other little details for an impressive ceremony, simple yet refined. 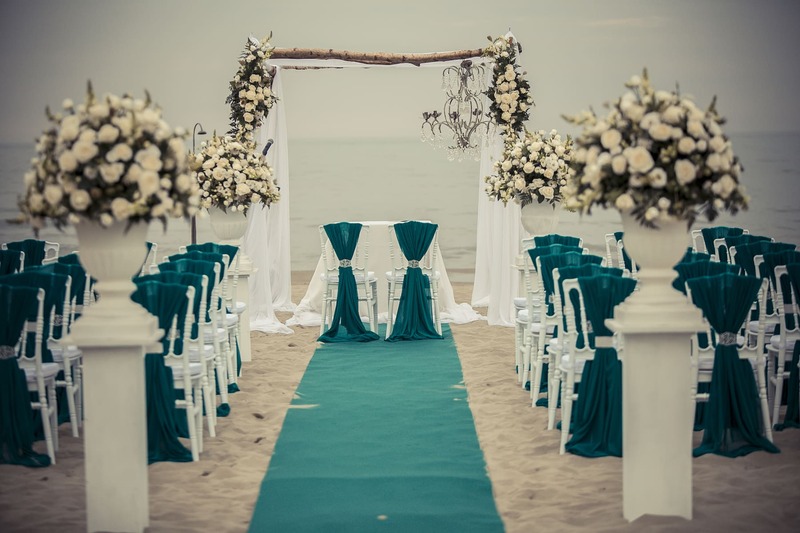 Do you dream of celebrating your wedding at the beach? Feel free to contact us. We will create a wedding project tailored to your tastes and needs.